WooCommerce is a powerful, fully-customizable, open-source ecommerce solution developed specifically for WordPress, with a series of Representational State Transfer (REST) API frameworks for guided web development. It’s a huge enabler for any web applications you may want to develop for ecommerce purposes, but to get things going you’ll first have to learn and appreciate the power of the REST API in this regard. A REST API endpoint enables you as a developer to interact with data in many advantageous ways far beyond the limitations of a front-end interface. The WooCommerce REST API gives you a complete ecommerce platform to operate from in any external app you may develop. You could find it a little bit overwhelming in the beginning but once you are fully familiar with its workings you will realize it is worthy the effort and time for your future ecommerce projects. For example, if you have a website which you want to enable to take appointments online, you can choose to use WooCommerce bookings to accept reservations, and then use the WooCommerce API to synch the appointments with your own software you are using to accept bookings offline. This is only one example of the power of using the WooCommerce API to create your own integrations and solutions. Our discussion in this article here will introduce you to the power of REST APIs, explaining their importance in app development with a complete three-step examination of WooCommerce’s potential. Read on to find out all about it. REST APIs act as an interoperability medium between completely different online frameworks and solutions. In simple language, what we mean here is that REST APIs enable you to interact and operate on data stored in a program like WordPress from a separate platform such as a desktop or native mobile application. Previously, developers like you had to part with thousands of dollars in order to build custom APIs for edge scenarios. But today, a REST API endpoint is included in each new installation of WordPress. You can now freely test and experiment with new applications of it as much as you want. Isn’t this great news for creative developers? Absolutely! Additionally, readily available REST API frameworks are a powerful asset for ecommerce enterprises too. Right now, integrated niche-specific software solutions, compatibility with legacy systems, and even connectivity to wearable devices are easily available! 1) Decoupling your data from its existing WordPress interface to develop native apps using such language as React Native. 2) Syndicating content from several sites; a particularly beneficial thing if you manage a large business network and need to pull all feeds into one site. Now that you’ve had a taste of what can be achieved for your average run-of-the-mill WordPress website, imagine what you can do for your full-fledged ecommerce store. 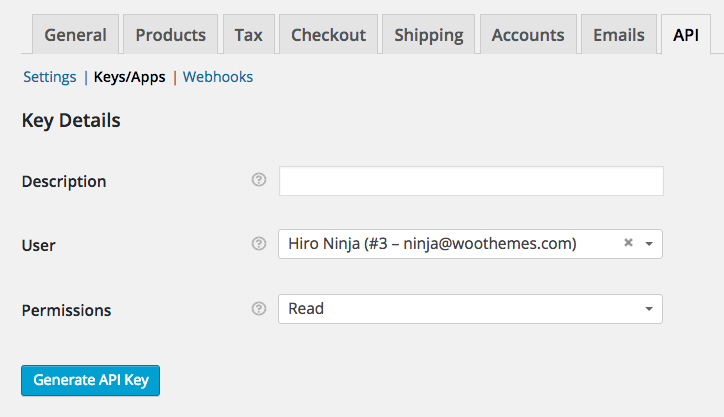 WooCommerce comes with extensive customizable additions to the WordPress API, enabling you get access to all your ecommerce data beyond the regular posts and pages. Here, you’ll understand how to authenticate and have access to the REST API using the command line interface. The final language to use in order to interact with the REST API framework will, obviously, depend on the type of application you’re developing. 1) WooCommerce generates two random character strings known as the “Consumer Key” and the “Secret Key”. 2) These are what you use during your REST API calls to prove your identity and get authorized for access. Click on “Generate API Key” to finish the process and record the resulting keys somewhere you only have access to. You’ll need these to complete the rest of the process. Each web app using the WooCommerce REST API is unique and needs different calls. Instead of having to learn each REST API endpoint separately, you may use the dedicated manual to find whatever you need in a given situation. This also helps to keep up as the REST API gets updates. 1) Go through the Requirements section and confirm you have got the correct and most up-to-date versions of both WooCommerce and WordPress. 2) Familiarize yourself with JSON and JSONP. These are the primary methods of transfering data. 3) Get familiar with the error codes to make it easy for you to debug issues faster whenever necessary. 4) Take advantage of the provided tools and resources to enable you perform an even easier integration. Set up a demo WooCommerce website to practice on. Use the terminal or a few lines of PHP to familiarize yourself with the API until you’re totally comfortable with its various commands. You can also try viewing, creating and even modifying the products, orders and customers in your store. Once you have known how to pull and create data using the tools provided by the REST API with authentication, you can apply the native programming language of your new web app to achieve the same. To help you in this, the documentation manual provides code samples for both Node.js and PHP. The REST API also makes it easy for you to interact using platforms that are otherwise unrelated to both WordPress and WooCommerce. This is a key part of the API’s power and appeal. 1) Develop a native mobile shopping application using React Native that is customized to meet your customers’ shopping needs and habits. 2) Syndicate products from many WooCommerce websites in a single convenient catalog. 3) Try a beta/test version of your shopping website while at the same time keeping the data synced so as not to lose any sales information. 4) Build both web and desktop apps where your users are easily able to manage their accounts as well as past orders. WooCommerce has emerged as a very popular solution for ecommerce enterprises in part due to its ability to offer a complete REST API that enables developers build powerful solutions. If you learn how to apply it, it will help you develop robust and fully-featured external applications for your customers. 1) Preparing an easy installation for WooCommerce REST API authorization. 2) Learning from the developer documentation manual. 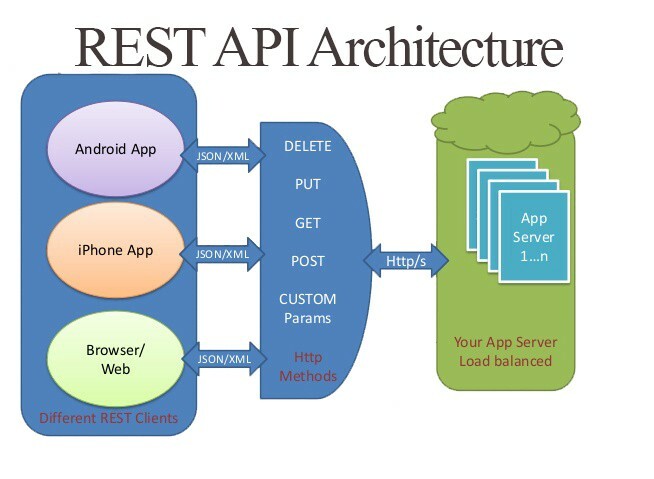 3) Integrating your REST API framework into external apps. For any questions, you can always reach us via our comments section below! This entry was posted in Business and Technology Chatter, CMS, Codango™ Blog, Codango™ Network, PHP, Programming, Remote Methods, SEO, Tech Topics, Tutorials, Web Publishing, Wordpress and tagged api, PHP, REST, REST API, woocommerce, wordpress by Codango Admin. Bookmark the permalink.